So, what exactly is an American Wild Ale, or Sour Ale? I'm not real sure myself, since this was the first one I've ever had. Found it on tap at Buster's on 28th in South Minneapolis, and after having it was so intrigued that I had to research the style and this specific offering. Turns out the information is fairly limited, and unfortunately, pretty jargony. An American Wild Ale is beer that uses one of three types of wild yeast or bacteria. The style became popular when American brewers tried to recreate traditional Belgian brews called Lambics. Lambics were spontaneously fermented by wild yeast that was only available in a certain region of the country. The result was an unmistakable taste: dry, fruity and very acidic. This beer fits the bill. The nose (I'll use a wine term because the smell was so...winey) was similar to a sharp, sour cherry cider. Only, the cider has been hiding behind the baking soda in your fridge for a few years. It smells like rank, fermented cider, which is not far off from what it actually is: rank, fermented beer. The taste, however, was quite pleasant. It sparkled like ginger ale, soured the mouth like a crab apple and filled the mouth with a handful of fruity flavors. If you didn't know it was beer, and it was your first sour ale experience, you might think it was cider, if not for the faint malt presence toward the end of the swallow. The description at Buster's also mentioned a small whiskey presence, and though I wouldn't have noticed it without the forewarning, it was a nice contrast at the back end of the gulp. 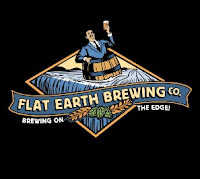 The Buster's bio also claimed this beer, of which Flat Earth brewed only three barrels, had a "slight inner city funk" to it. There was definitely funk, but I thought that could be attributed to the wild bacteria. Just me. If the purpose of this project is to discover and sample every different style of beer available, this was a good step. It's a big leap for a so-called beer lover to admit that fruit has a place in beerdom, and I had been hesitant to accept the large amount of highly-rated lambics on beer message boards. This tasting will help. It may not be the best American Wild Ale out there, and I'm certainly not the one to decide, but it's good enough to make me want to try more.